We won’t sell you a baby puppy! Why? Some are a bit stunned to find we won’t sell a puppy under 4.5 months of age. We have been working with this breed for over fifty years and the decision not to run with the mob and sell baby puppies was taken for the sake of the breed, the dog, and the buyer. It would be oh so, so easy to just say, yes, we will sell under 4.5 months of age – and that is what most people do. But we don’t. 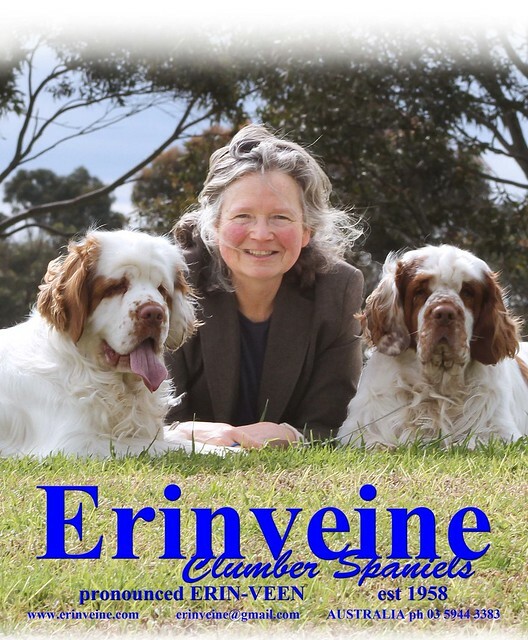 The Erinveine commitment at every step is to the health and well being of any Clumber we breed. To sell under 4.5 months of age is not an acceptable idea to us based on practical and personal experience, and by the way, the scientific literature is very supportive of this unusual protocol! Clumbers, like all dogs, are social/pack animals in their first instance – witness the FACT that dogs have LITTERS, singleton pups are very rare in the great scheme of things. Clumbers should be allowed to grow up in a social pack – with dogs, not just humans. At Erinveine, they are a shade luckier in having paddocks to investigate and enjoy during exercise periods, and a good number of adult dogs to learn their social skills from. If anything, they may not have an over abundance of human numbers to interact with but just try keeping visitors away from the puppies. And, of course, being aware of this slight issue, we take several steps to mediate any effect from this. There is little material collated on wild dog packs, so if we look to the ‘ancestral’ wolf of the modern dog, as that wolf lives in the modern world, the wolf cub does not leave its home at 8 weeks of age – nor do our Clumbers. Equally importantly, by having the opportunity to raise the whole litter together or in smaller sub-groups I can better assess the temperament of each pup and better match them to an appropriate home – that is not feasible or possible at 8 weeks of age. The same applies equally to breed type and conformation and soundness of health and conformation, these can be guessed at 8 weeks of age but the opportunity to view and assess these over another 2.5 months is exceptionally valuable. Yes, we wean a shade earlier then many other breeders, but that is based on minimizing the risk of infection before vaccination can be correctly and safely administered (manufacturers research has demonstrated that a puppy should be weaned – with no mother’s milk intake – for a minimum of 10 days, this we do) without jeopardizing social interaction or the opportunity to experience new environments. You will find, if you quiz them carefully, most breeders do none of this. Yes, if your dog needs to be freighted to reach you, you will be paying more – but you are travelling a teenager not a baby, a dog that is more likely to survive the traumatic experience of the trip. And, no doubt for many good reasons, you cannot travel a pup under 12 weeks of age between countries. A 4.5 month old puppy is much more likely to be socially competent to fit into your lifestyle and live with any existing residents than a mere baby puppy. A 4.5 month old puppy is ready to join you in trips and activities outside your home. You can expect a Clumber to comfortably reach 10 years, many will do more, but for the sake of the argument lets assume 10, and it will make the maths easier! An 8 week old puppy is then the equivalent of 1.5% of the life expectancy, in human terms (assuming 80 year lifespan) that would make your 8 week old puppy 1.2 years old – not an age a child gets sent off to preschool or kinder and look how many trained or experienced teachers are looking after them when they do get there! A child can expect to attend preschool (and so be away from the family and family adult direct care) at 4 years, translate that back to puppy age and that is 4/80 x life expectancy, that’s 0.5 years, 6 months of age! So what age should you get a pup? then, yes, 8 weeks is a great age. or time to do justice to these specialist activities? Of course you may well be better equipped than the breeder! then you must expect the pup to be 4.5 months old. For such a mature and well moulded puppy expect to pay a small premium for the added time and dedication in producing a real little Clumber rather than a mere baby puppy without much personality and certainly not passed the reasonable screening age for basics like heart murmurs. By the way, we consider ourselves breeders of Clumber Spaniels not puppies. One has to ask the status of people not prepared to put time into raising puppies beyond the minimum age they can legally transfer a pup. The price we charge reflects our experience, effort and the value of the bloodlines – I would not recommend you paid the same price we charge (for a puppy of 4.5 months) if you are buying an 8 week old puppy. Dogs are social creatures and should be raised with their family until their adult teeth cut.